Unveil haunted castles that will leave your spine tingling. "Once you start you cannot stop playing. The graphics are bright and pleasant. The challenge increases as you proceed into the game. I would recommend buying." Unravel this creepy-crawly adventure as you unveil haunted castles one Match-3 puzzle at a time. Explore vast levels at your own pace with three different modes to fit your gameplay style. Then buy upgrades from the sinister shop to aid you in your travels. Play mini-games including Hidden Object and Mahjong to earn bonus money and unlock spooky decorations for each eerie scene. Featuring 120 enormous levels, 48 replayable bonus games, gorgeous wallpapers and a spooky soundtrack, Jewel Match: Twilight will leave your spine tingling. 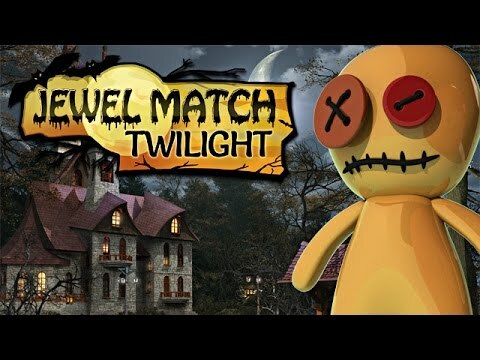 Jewel Match: Twilight is colorful, exciting, fast or slow paced, and very easy to understand. The levels are all equally great. It went quickly and was more interesting than most of the other games in this genre. Good graphics. I would recommend this game. I enjoyed this Match 3 game. Game play was challenging, not mindless. It started me on the Jewel Match series of games! This game has cute music and great themed images. If you are looking for a time killer or just something different, this is for you! I like the Jewel Match series a lot, and really enjoyed this variation. Cute graphics, fun gameplay, just an all around fun game.